Small scale, delicately painted in blue, rose & ivory. The cartouche-shaped back carved with scrolling acanthus & chanelling filled with flowerheads & trailing leaves. Gently outswept arms with upholstered elbow-rests with edge-moulding, scrolled handholds & carved S-form supports. 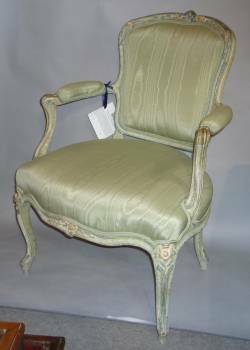 Serpentine-shaped seat centering a pair of flowerheads, the cabriole legs with further flowerheads & acanthus clasps.